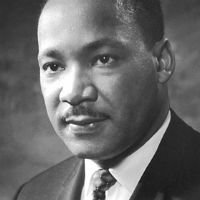 As the day of observance of the works and influence wrought by Martin Luther King, Jr. and his co-activists (and those who followed him and continued his work) arrives today, it marks a time of reflection on where we stand, as a society, in terms of recognizing the issues of racism that continue to affect us to this day. To advance atheism through activism, philanthropy, education, and by cultivating a positive secular community. It’s important to focus on the last part of the statement: we’re seeking to cultivate a positive secular community, and, implicit in that statement, is the need for a safe secular community. We could not achieve this if we blithely ignored the issues that face people of color – not only in subtle and overt racism by individual citizens in our society, but also in the issues of increased rates of incarceration; disproportionately harsher penalties for crimes (compared to similar white offenders); the increase in violence – both by police and private individuals – against black people (and other people of color); as well as a multitude of other factors that negatively affect non-white people. We must also acknowledge the harms of white privilege – as an even minimal start to the list, we can recognize the complement to those issues listed above: the decreased risk of arrest, conviction, punishment, and harm at the hands of our justice system if you happened to be born with white skin. As I mentioned, KCAC has been working to find how it can best support the (what shall henceforth be called) #BlackLivesMatter movement. A large part of this is learning about organizations and people local to Kansas City who are working to forward the movement. We, of course, would be remiss if we did not mention the work done by Kansas City’s own local organization, One Struggle KC. Presently, religious organizations lead the charge in many ways in organizing the movement – providing safe spaces for various members of the movement to meet and organize and experienced leadership in moving the movement forward to meet its goals. Not to imply that anyone needs our permission for this to continue, but, speaking as president of KCAC, I want to make it clear that we support leadership in this form: if the only thing we disagree about is the existence of a god, then, by all means, let’s not let that stop us from working together to meet the goals we share in common. The implication of this, however, is that KCAC isn’t likely to ever emerge as a leader in the #BlackLivesMatter movement. The board feels that this is fine. As I mentioned in a previous statement on Ferguson, this is a time for us to follow experienced leadership in the movement and do what we can as allies to support the movement. This means that we listen, learn, and take what we learn from the experiences of others and work to apply it in our own communities – for myself, this means KCAC and Kansas City Oasis. This does not mean that we feel that atheists have no direct place in the movement, of course, nor that we who identify as humanists have any less of an obligation to support the fight against racism. Indeed, there are a number of activists – local and afar – who identify as atheists and are active leaders in organizing the #BlackLivesMatter movement. One of the most prominent and recent examples of this was the People of Color Beyond Faith social justice conference in Los Angeles. We would be doing a disservice to pretend that these dedicated activists do not exist. Today, then, is a day where we all should reflect on what our place is in the movement to bring equality for all people and, in particular, to reduce and eventually eliminate the prejudicial harm that affects people of color in our society. We can – and should – appreciate the work of today’s activists and their predecessors, not merely stopping at Dr. King, but reaching further back into history to acknowledge the work of his predecessors, too. We don’t have to agree on approach or tactics, but, going forward, we must at least all continue to add our voices to the collective push against racism in all its forms – to, as Dr. King himself said, not propagate the silence of good people. No Comments to "MLK Day in Reflection: Black Lives Matter"